Today is day three of our freezer meal series. Make sure to check out Day One (Honey Teriyaki Chicken) and Day Two(Garlic Parmesan Pizza Pasta). Today's recipe is for pork chops. 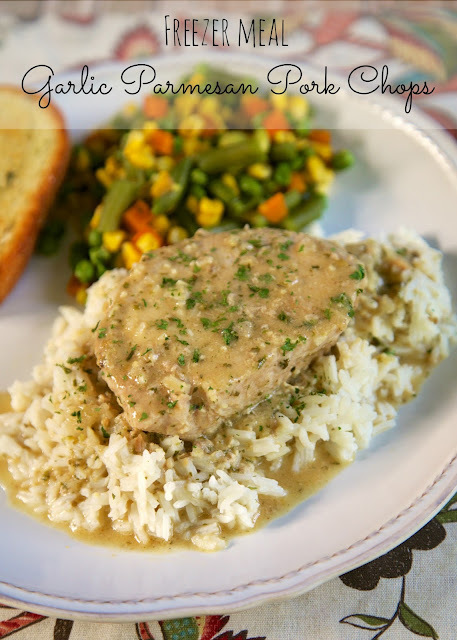 The pork chops are extremely flavorful and tender. My favorite part of this dish was probably the sauce. Don't waste the sauce! Serve the pork chops over something that will soak up all the yummy sauce. 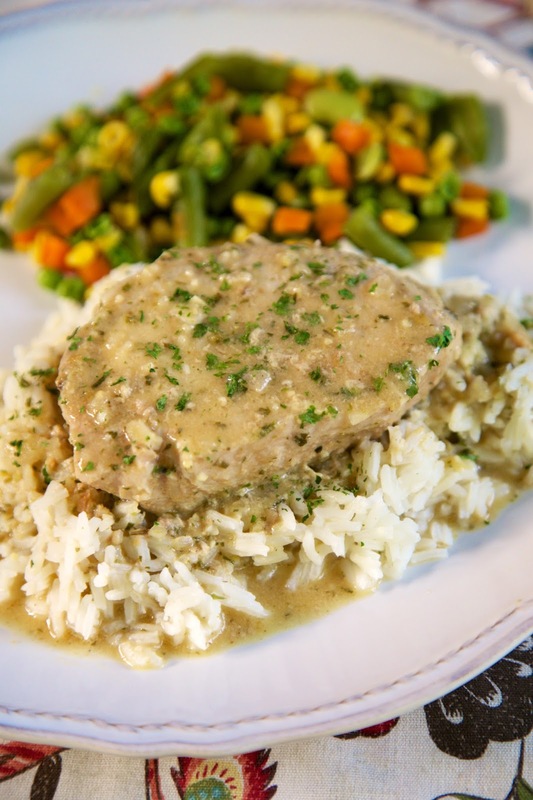 We served the pork chops over rice, but this would also be great over mashed potatoes or noodles. Place all ingredients in a gallon size ziplock freezer bag. Freeze. When ready to cook: Place contents of freezer bag in slow cooker. Cook on LOW for 6 hours. Serve over rice, noodles or mashed potatoes. Do you thaw out overnight before adding to the crockpot? I have started making freezer meals to get ready to return to work so I'm hoping to add a few more. Thanks! Just put everything in the slow cooker frozen - no need to thaw before hand. Do you think this would work with a boneless pork roast? Do you have to freeze it? I'm loving these freezer meals Stephanie. I sure do need these after a busy work day. This looks fantastic! Especially with the rice. Definitely a must try. I'm feeling stupid. Now that I'm going to actually cook it, do you remove it from the freezer bag before cooking it? Yes - remove the mixture from the bag. Cook it frozen. It should peel out of the ziplock bag easily. How could I cook this in the oven after thawed? Silly question but...am I missing the Parmesan part of this? The garlic bread seasoning has Parmesan in it. Do you have to cook the pork chops before freezing it? No - you do not need to cook the pork chops. Freeze them raw. No. It will over cook if you add it to the freezer bag. It needs to be made separately. Where does the parmesan come in? Wasn't sure what I am missing? Maybe add at the end? Sounds Yum!!! Can you do this in a smaller portion (1/2) or will it not cook right in a big crock?